Learn how to craft these cute snowman ornaments for Christmas. The PDF Version contains all instructions and patterns for making the ornaments. The Easy Print/PDF Version contains all instructions and patterns for making the snowman ornaments without margins, ads or logos. Cut out all pieces for snowman and accessories using the patterns located through the link in the materials list. With wrong sides together, Pin both snowman pieces together. Trim ¼ inch off of the seam allowance edge after you are done stitching. Turn the snowman right side out through the bottom hole. Press all edges with your iron. Gently stuff the snowman with poly fill until he is just about ½ inch thick. Stitch up the bottom opening with white thread. Insert a Y stick into each of the arm openings about 1 ½ inches deep. 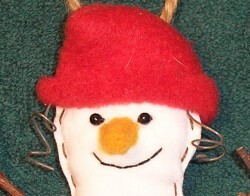 Using 3 strands of brown embroidery floss, start a running stitch around the snowman about 1/8 inch from the finished edge. When you get to one of the arm sticks, stitch tightly around the stick 3 times before continuing around the snowman. Using orange thread, one strand, stitch the nose together and then onto the face. Tie the scarf piece around his neck. Stick the piece of craft wire through her forehead. (The areas where the wire goes in and out of her head will be covered by the hat). Wind each end of the wire around a pencil to make curly ringlets. For the hat, fold the hat piece in half, wrong sides together. Turn right side out, turn up the bottom edge and sew into place on the girls head. Stitch patches into place on her body. Glue rusty star shapes as buttons onto her body. Add a little blush to her cheeks if you want. For a hanger, use a 6 inch piece of twine string, tie the ends together and stitch the loop to the back of the snowman's head. Or you can use embroidery floss and a needle to just stitch a piece through the back of the head and tie the ends together to form a loop hanger. 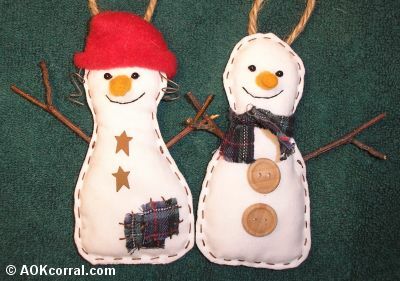 These snowman ornaments look cute and homemade on your Christmas tree! The Easy Print Version contains all instructions and patterns for making the snowman ornaments without margins, ads or logos.